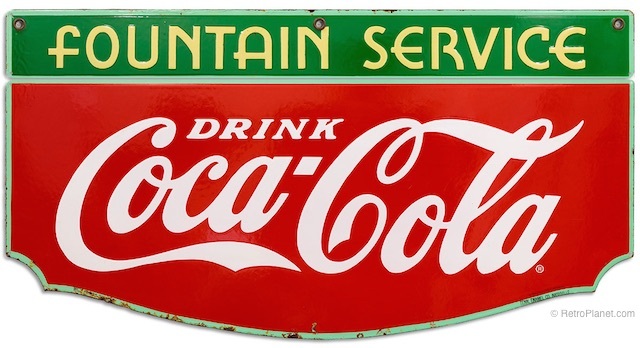 The Coca-Cola Fountain Service Banner Large Metal Sign is a striking example of Coca-Cola vintage advertising. Made new and to order this sign is available in sizes from 36, 48, 60 to 72 inches in width. When you’d like to have an ice cold Coca-Cola nowadays, you can crack open a can or bottle from the store or stop by a Coca-Cola vending machine. It’s hard to imagine that before 1894, it was only possible to have a Coca-Cola by visiting the soda fountain counter at the local pharmacy. The very first glass of Coca-Cola was served this way on May 8, 1886 at Jacobs Pharmacy in Atlanta, Georgia. It’s an interesting story as to how this came about. 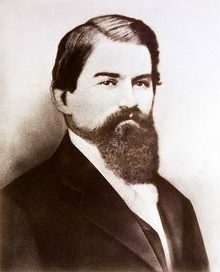 The Atlanta chemist and pharmacist, Dr. John “Stith” Pemberton, in order to manage his pain caused by a near-fatal injury during the Civil War, began drinking coca wines like Vin Mariani, made of red Bordeaux wine and coca leaves. He created his own version, Pemberton’s French Wine Coca, which he described as being “composed of an extract from the leaf of Peruvian Coca, the purest wine, and the kola nut.” The drink was very popular in the Atlanta region until prohibition was passed in 1886 and Pemberton realized he needed to replace his drink with a non-alcoholic tonic. The Spencerian script logo created by Frank M. Robinson in 1886. So on May 8, 1886, Pemberton bottled up a jug of his new Coca-Cola and carried it to Jacobs Pharmacy on the corner of Peachtree and Marietta Streets in Atlanta, Georgia. 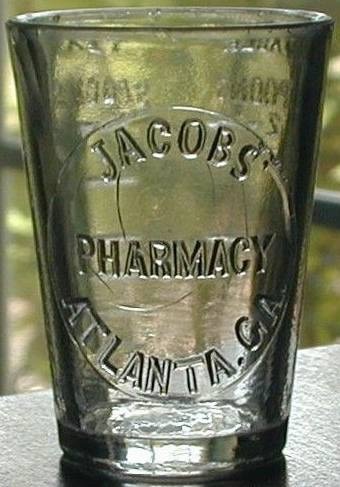 Jacobs Pharmacy, the leading pharmacy in Atlanta with one of the largest soda fountains in the South, was owned by Dr. Joseph Jacobs. He leased the soda fountain to Willis Venable, known as Atlanta’s “soda water king.” In Victorian times, pharmacy soda fountains were meeting places to catch up on the latest news and to drink soda water and other carbonated soft drinks considered beneficial to the health. In addition to dispensing medicines, pharmacies sold a wide variety of other items, similar to a general store. A Jacob’s Pharmacy soda fountain glass. 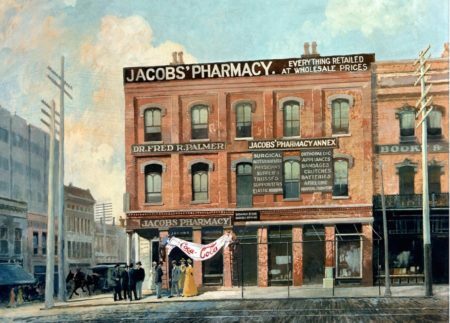 Artist’s rendering of Jacob’s Pharmacy in Atlanta, Georgia in 1886. Image credit: www.coca-cola.co.uk. A serving of Coca-Cola was made by dispensing one part of Pemberton’s syrup into a glass and five parts cold carbonated water was added to finish the drink. The customers at Jacobs Pharmacy that first day were said to have tried the new beverage and declared it to be “excellent”. Very happy with his results, Pemberton put his Coca-Cola on sale for 5 cents a glass. 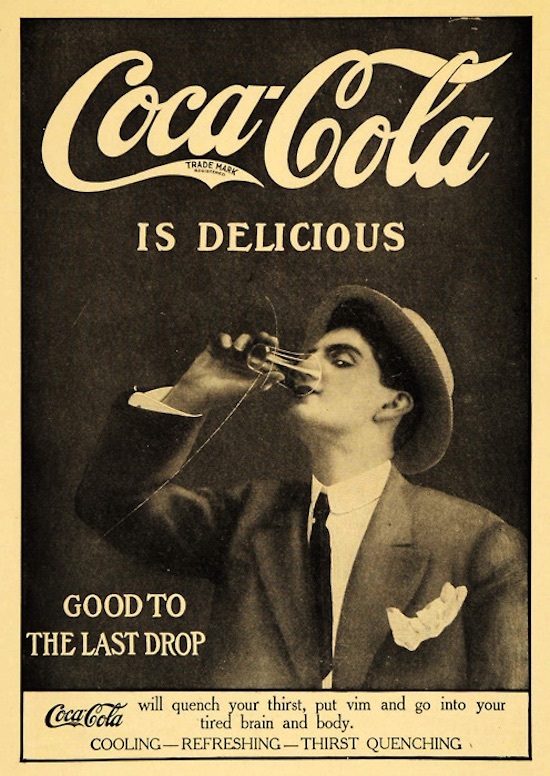 In the words of Pemberton himself, Coca-Cola was “delicious and refreshing.” In its early days, Coca-Cola was sold as a patent medicine meant to cure lethargy, headaches and more. 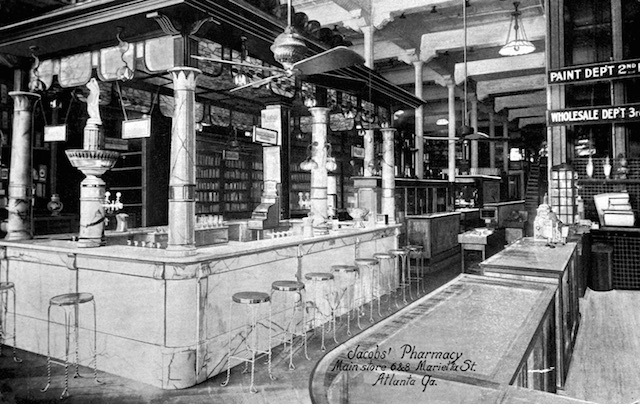 The Jacob’s Pharmacy interior in 1900. Image credit: www.coca-colacompany.com. 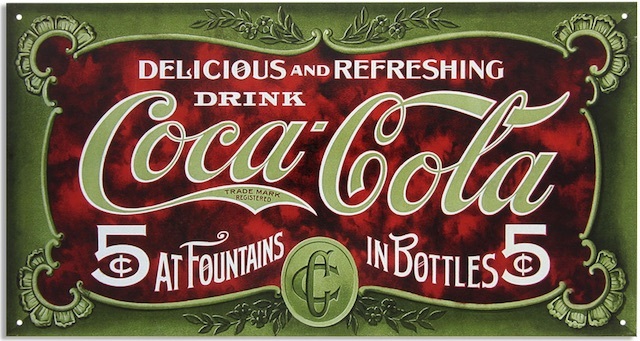 The first Coca-Cola print ad appeared in the Atlanta Journal bidding customers to stop in for “the new and popular soda fountain drink.” The ad also declared Coca-Cola to be “Delicious, refreshing, exhilarating” and “invigorating.” The first Coca-Cola storefront signs were handprinted oilcloth versions strung across awnings with the invitation to “Drink”. 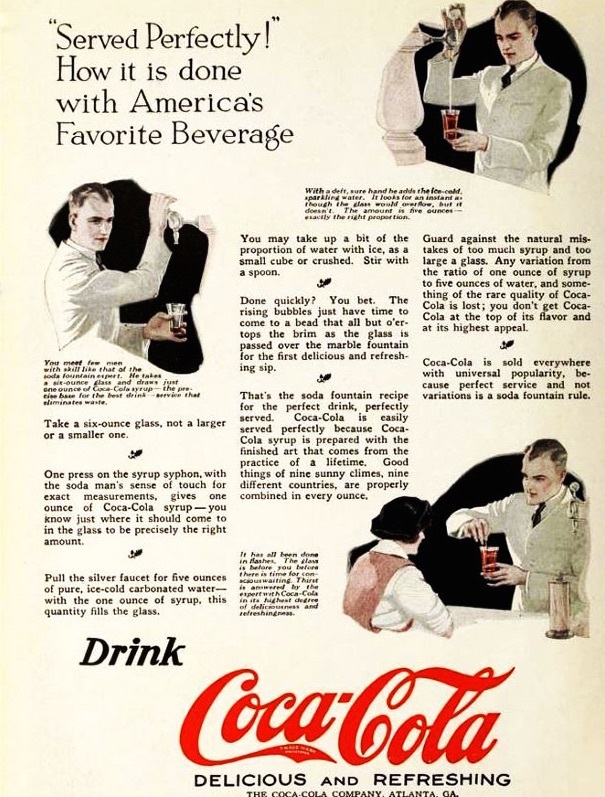 These were the earliest manifestations of what would become the incredible marketing campaigns that helped make Coca-Cola the most consumed soft drink in the U.S.
A 1921 publication for soda fountain owners explaining the proper way to serve a Coca-Cola. According to information from the Library of Congress, sales of Coca-Cola had gone from one million in 1890 to one hundred million by the year 1900. 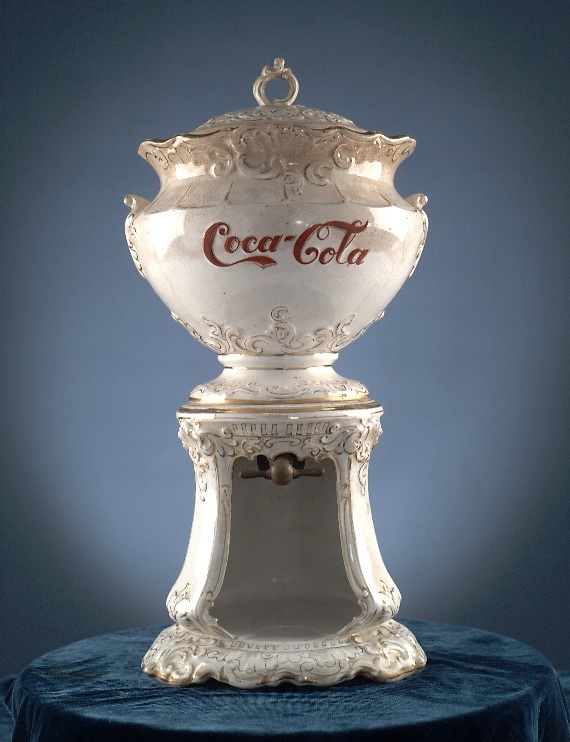 Starting in 1896, the Coca-Cola Company began offering ceramic urns to soda fountain owners as an incentive. Dealers who dispensed enough gallons of Coca-Cola syrup in a year were offered an urn as a premium that also served as point-of-sale advertising at the soda fountains. The porcelain dispensers were made by the Wheeling Pottery Company of Wheeling, West Virginia and were designed to reflect the late Victorian style of the time. The large bowl on the dispenser was filled with Coca-Cola syrup that was dispensed out of a faucet below into the glass through the force of gravity. The Drink Coca-Cola Sold Here Ice Cold decal is officially licensed by The Coca-Cola Company and sold only at RetroPlanet.com. This sticker is available in widths from 24, 36, 48 to 60 inches. Businessman Asa G. Candler had the vision and drive to turn Coca-Cola into a tremendously successful brand in his lifetime with a $2,300 investment and a flair for marketing. 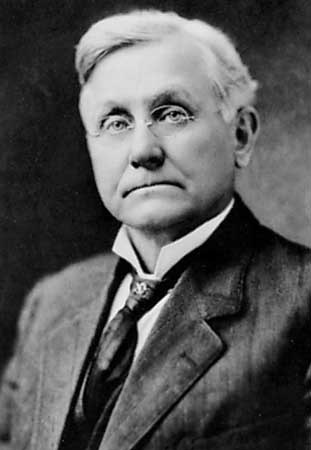 Within two years of creating Coca-Cola, Pemberton sold his rights to the Coca-Cola formula to pharmacist and businessman, Asa G. Candler. Determined to grow the business and distributorship of Coca-Cola, Candler sold Coca-Cola to soda fountains further and further outside of Atlanta. In 1890, an enterprising confectioner added a soda fountain to his candy store and in 1894, seeing the increased demand for Coca-Cola, conceived of bottling Coca-Cola in order to allow for its consumption beyond local soda fountains. He installed bottling machinery in the rear of his store and became the first business to sell Coca-Cola in bottles. The first glass of Coca-Cola was sold for five cents and both glasses and bottles continued to be sold for a nickel for 70 years. This 16 x 8.5-inch metal sign is available at RetroPlanet.com. 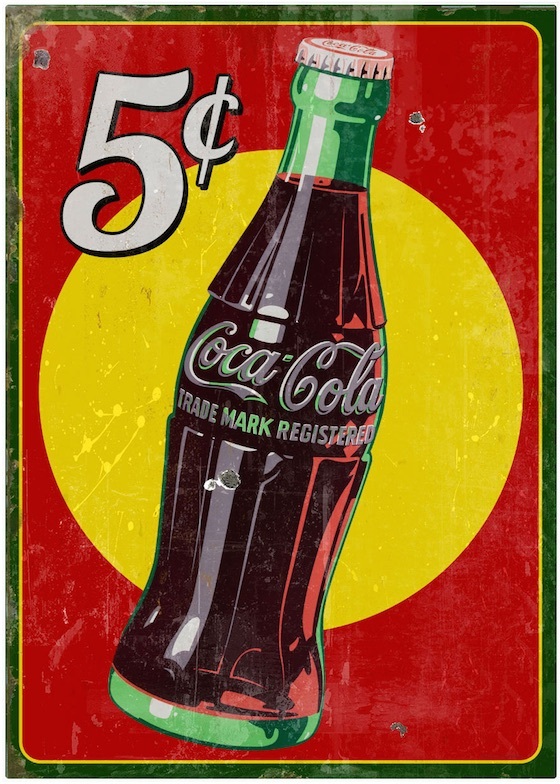 The Coca-Cola 5 Cents Bottle decal is officially licensed by The Coca-Cola Company and sold only at RetroPlanet.com. This sticker is available in lengths from 12, 24, 36, 48 to 60 inches. In 1899 three Tennessee businessmen purchased the bottling rights for Coca-Cola from Asa Candler for only $1. Benjamin Thomas, Joseph Whitehead and John Lupton were responsible for beginning and developing the bottling system for Coca-Cola that is now used all over the world today. 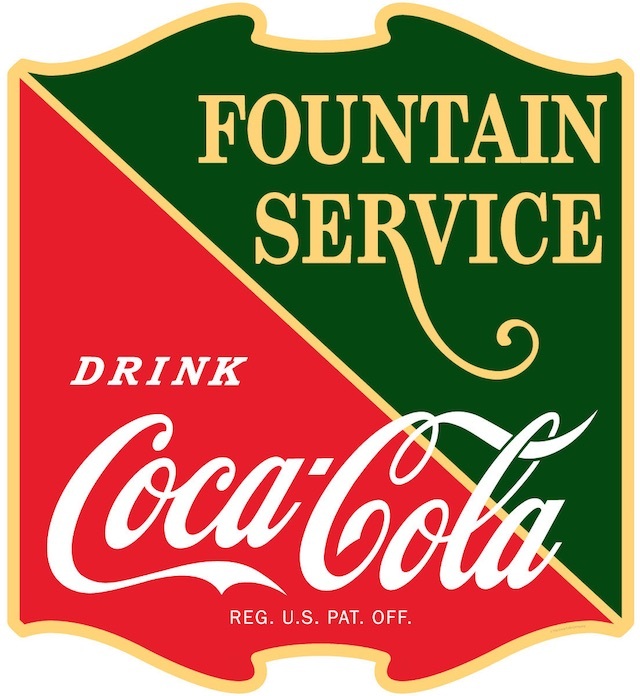 The Fountain Service Drink Coca-Cola decal is a licensed reproduction of vintage Coca-Cola advertising. Available only at RetroPlanet.com, it’s available in sizes from 12, 24, 36 to 48 inches tall. From its humble beginnings in a pharmacy soda fountain and a mere fours years after its invention as a medicinal tonic and temperance drink, Coca-Cola exploded into the most popular soft drink the world over.